Chances are, you have tons of information stored in your various social media accounts. Everything from photos and videos to chats with friends, contact lists, and more. If your favorite social network goes offline or becomes unavailable for any reason, all of that data could disappear. But not if you've backed it up with SocialSafe, an easy-to-use PC and Mac tool that makes safeguarding your social data downright fun. SocialSafe makes it easy to pick and choose which accounts you'd like it to back up. SocialSafe is free to try for 60 days, but the free version is limited to syncing four social media accounts. After the trial is up, you have to spring for a 12-month license to keep syncing your social networks. 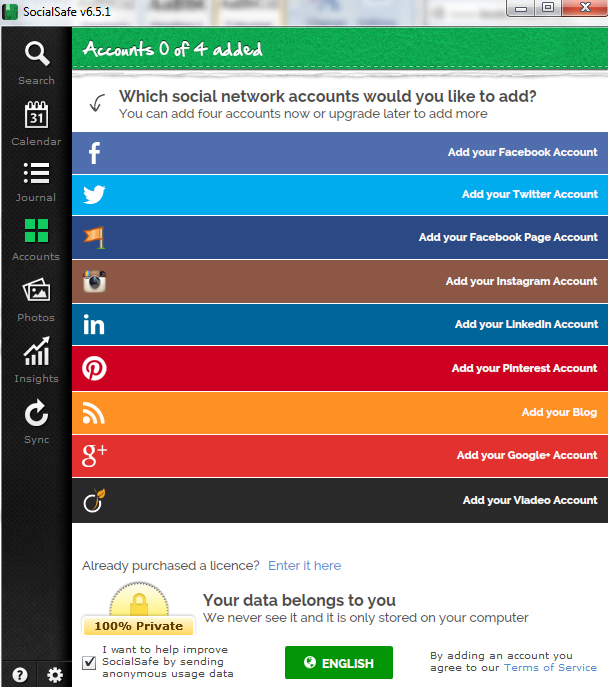 It costs $7 for four social network accounts, $17 for ten accounts, and $28 GBP for up to 20 accounts. Any data you download will always be available to you via SocialSafe, even if you do not renew your license. Using SocialSafe is simple: You authorize it to access your social media accounts, and then set it to sync. SocialSafe supports the biggies in social media, including Facebook, Instagram, LinkedIn, Twitter, Pinterest, Google+, Vladeo, various blog services, and Facebook pages. If you have more than one Facebook account, you can add both. 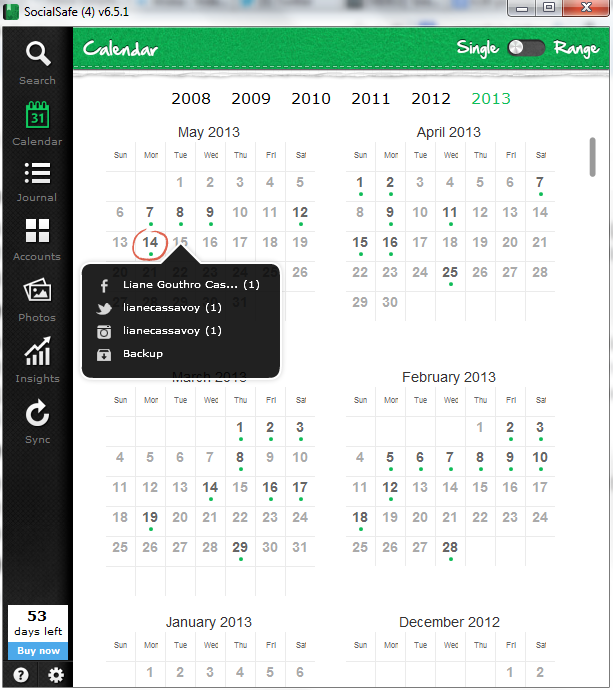 A thin column on the left side of SocialSafe's interface offers access to its main features. Once your accounts have been synced—which can take anywhere from minutes to hours, depending on how much info you have packed in there—SocialSafe stores the data right on your computer. You access all of the info using the SocialSafe interface, which is colorful, attractive, and intuitive. SocialSafe lets you browse through your social network activity and data in a variety of ways. The calendar view lets you see how active you were on a certain date, while the journal view lets you see your activity in more of a story format. The journal is organized by date, and you can flip through its pages to see your added friends, posted photos, status updates, tweets, and more. 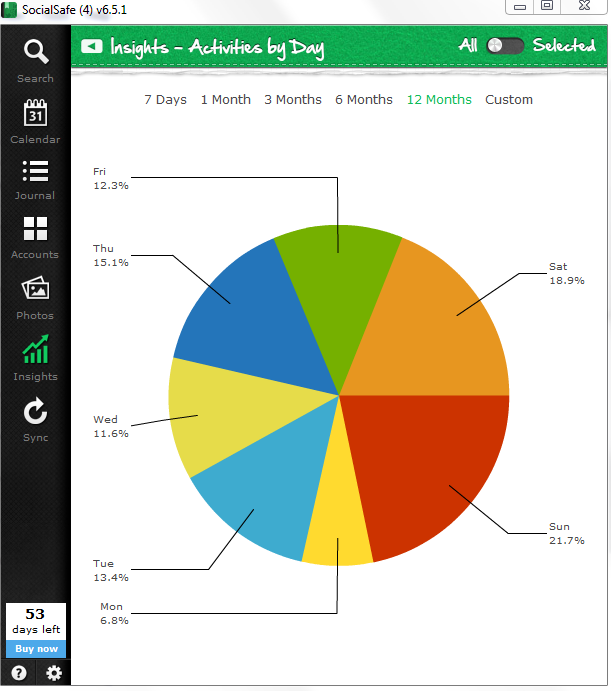 SocialSafe shows you how many times you were active on your various social networks on certain days. Anyone who relies on Facebook and Instagram to capture and store photos will appreciate how SocialSafe allows you to back up and browse all of your snapshots. You can export the photos to another location on your PC for editing or other uses, too. 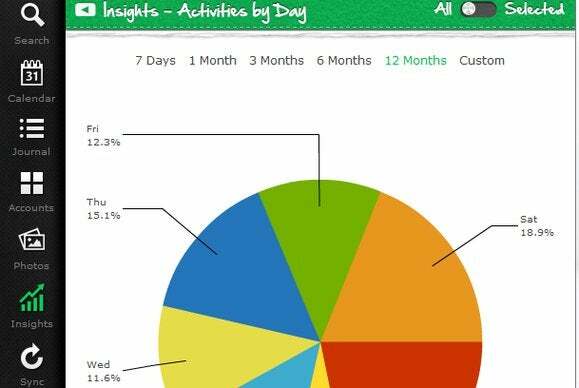 One of the most interesting aspects of SocialSafe is its Insights feature, which helps you gauge both the timing of your social networking activity and its reach with your friends and followers. You can see how often you post on certain days of the week, and which of your posts and online activities have proven the most popular. 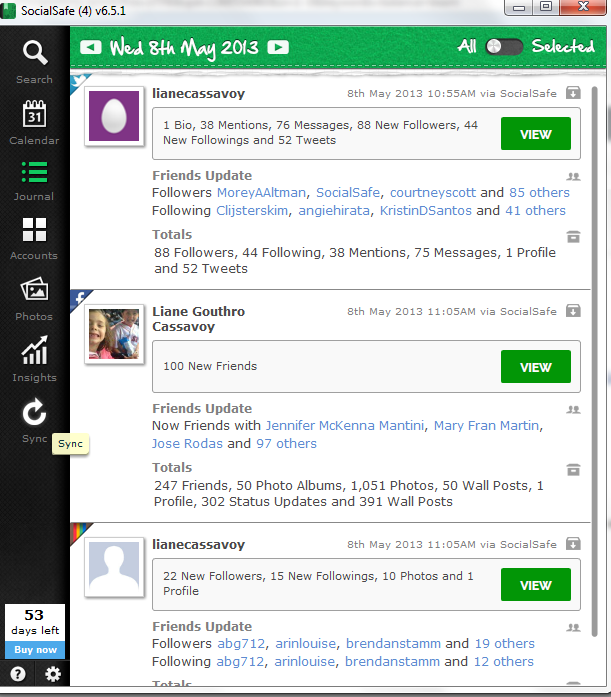 SocialSafe also shows you which friends you interact with the most and which photos have garnered the most feedback. SocialSafe breaks down your social networking activity by day of the week. I do wish SocialSafe synced your accounts automatically when you launched it, but that's a minor complaint, given that you can schedule the application to sync at a certain time each day. Overall, SocialSafe is a handy tool for backing up all of that data you store online…and one that makes it fun to browse. SocialSafe is an incredibly handy—and fun—way to back up all of the info you post on social networks.